​ When Lenin died on 21 January 1924 he was only 53, but his death had been anticipated after two assassination attempts had left him quite frail. Within 24 hours Goznak, the Soviet agency in charge of state printing, charged one of their new artists, Ivan Dubasov, to produce a Mourning Issue to commemorate his death. Ivan gave the young nation a design that is both striking and simple, and within a week the stamps were for sale across the country. The first printing was without perforations, but issues later that year added perforations and alterations in the red block to eliminate the white borders on sheets not carefully registered. 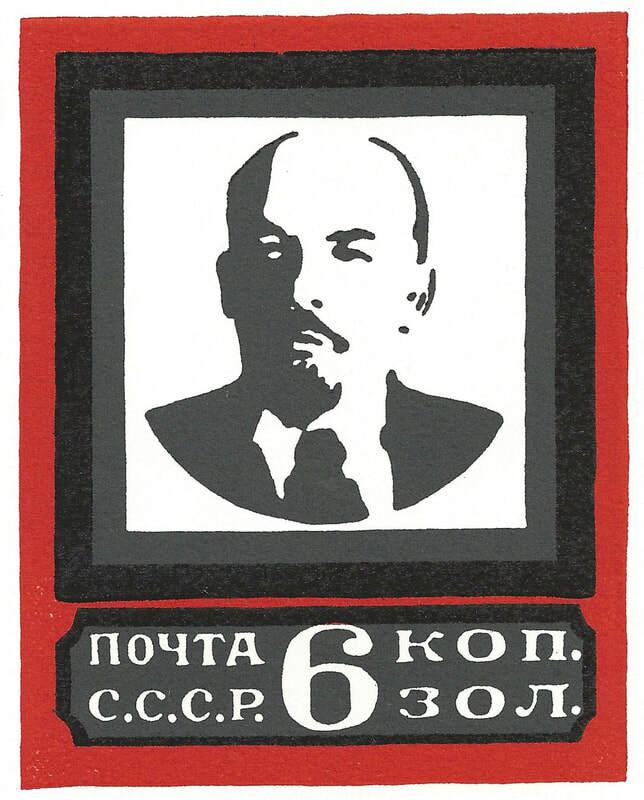 It was the first of many stamp designs to feature Lenin, who soon became the object of a personality cult persisting for decades. Dubasov's design was a significant departure from earlier Russian postage designs, and stands out clearly in catalogs of Soviet stamps. Because Lenin was instantly recognizable as the head of the Council of People's Commissars (the Central Committee of Soviet government), no caption was needed. The value tablet square is minimal and easily read, the square black block containing the Premier's part-silhouette positioned above and without adornment. This block may have been a reference to a 1915 work of abstraction from another Russian, Kasimir Malevich's Black Square, the ultimate minimal abstraction often called "the zero point of painting," a simple black square. Dubasov went on to become the head artist of Goznak for more than 40 years, leaving a legacy of many stamp designs when he died in 1988 at the age of 90 [ref. Ian Greenwood, The Great Survivor: The Stamps of Ivan Ivanovich Dubasov, www.stamporama.com]. Series dedicated to my childhood friend, Thomas Heard Kreneck, life-long student of history.